Citing the ‘value-for-money aspect’ of MDaemon — especially when compared its competitors — PC PRO magazine has given the popular email server a five-star review. 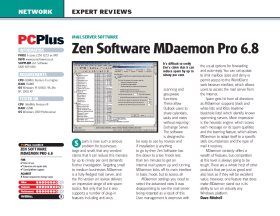 PC PRO especially praised the “clever” interface between MDaemon and the group sharing functions of Microsoft Outlook. MDaemon GroupWare makes MDaemon “a truly affordable alternative” to Outlook Exchange Server, according to the review.